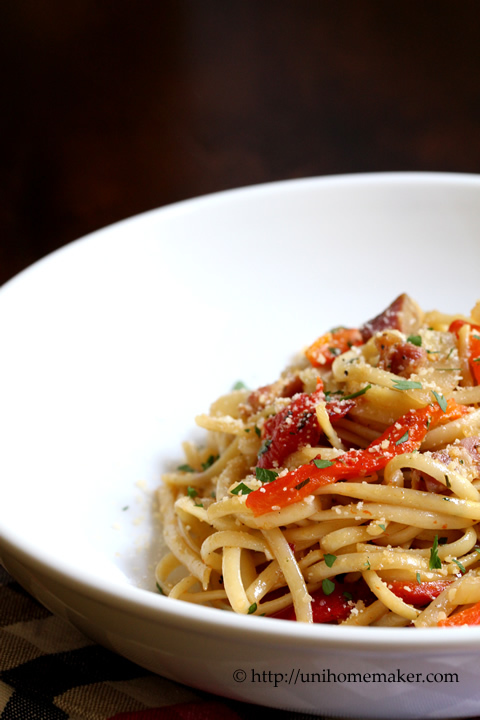 Today is National Pasta Day! And as such, I have prepared this lovely and tasty dish. 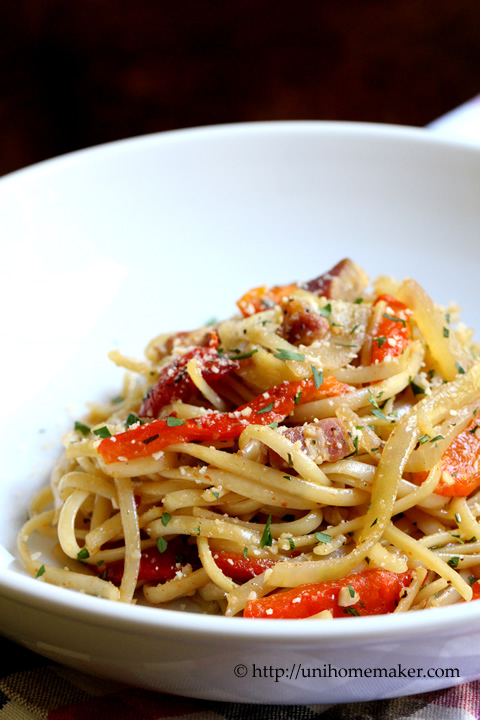 You may think pancetta and roasted red peppers are not flavorful enough, but with anchovy paste and white wine… it packs a ton of flavors! 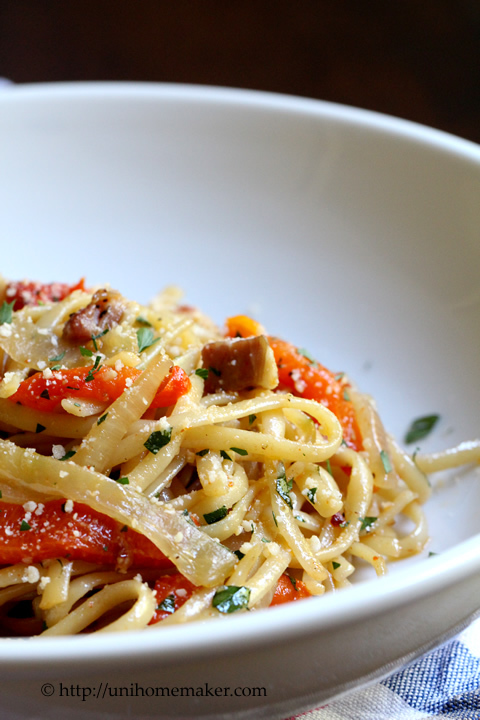 Now, I roasted my own red peppers but you can certainly go the quick and easy route and use jarred red peppers. This dish was quick to prepare and easy on the eyes. You can certainly entertain with this dish. Isn’t it pretty? I love the red and green contrast. Easy peasy, pretty and tasty! Have a great weekend and see you all next week! Arrange bell peppers on a baking sheet covered with aluminum foil and place it under the broiler. Roast the bell peppers and turn them occasionally with tongs until charred, about 15-20 minutes. Transfer to a large bowl and cover tightly with plastic wrap. Let the peppers cool for 15-20 minutes before handling them. Using your fingers, rub or peel the skin off the peppers and discard. Cut the stem and seeds from the peppers and discard. Julienne the peppers and set aside. In a large skillet over medium high heat add a little bit of olive oil and chopped pancetta to the pan and cook until brown. Using a slotted spoon, transfer pancetta to a plate and set aside. In the same skillet over medium high heat add olive oil, anchovy paste, sliced onion and garlic. Cook until onions soften then add red pepper flakes and dried thyme. Stir to combine. Pour wine into the pan and let it bubble and reduce, about 2 minutes. Add linguini, parsley and grated parmesan cheese. Toss pasta to combine and then add a bit of pasta water to bind everything. Remove the skillet from heat and add peppers and pancetta. 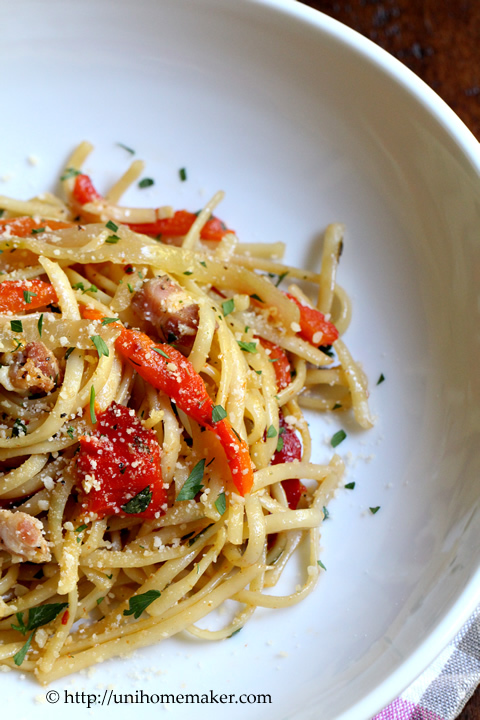 Continue to toss the pasta until everything is combined. At this point the pasta is ready. Check for seasoning, if needed, before serving. Garnish pasta with extra chopped parsley and extra parmesan cheese, if desired. This looks like a lovely and light pasta dish! oh man this looks good. love the colors, and i imagine a little bit of anchovy paste goes a long way in making this dish just the right amount of savory. i might have to give this one a try. love your blog, by the way. i just started reading your stuff recently, but the format is so clean i makes me want stay forever. keep up the awesome work! I love all the vibrant colors in this dish! 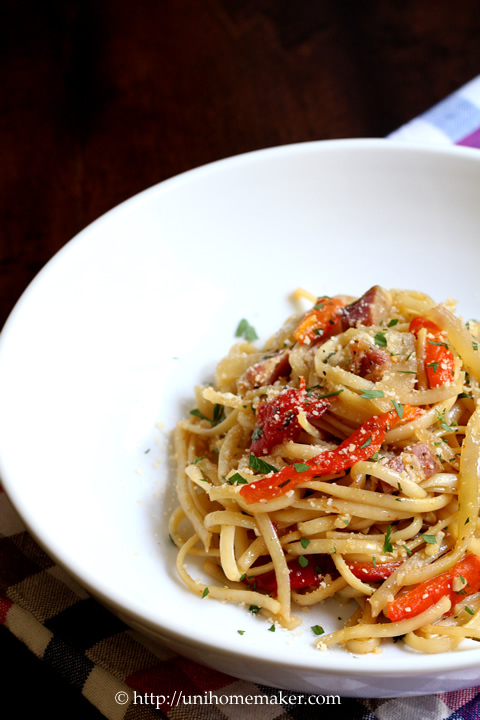 This has so many of my favorite flavors — chardonnay, pancetta, and parmesan, all in one dish?! This has my name written all over it : ) I must admit that I’ve never used anchovy paste, but I’ve been meaning to give it a try.